South Florida is the place to be Nov 23-28, when the WPT heads to the Seminole Hard Rock Hotel & Casino in Hollywood for the $3,500 Seminole Rock ‘N’ Roll Poker Open. This is the first time the WPT will be part of the hard-rockin’ action, but the tour has been a regular at Seminole Hard Rock through the years. The WPT first made its way to the property in 2011 and there have been many great moments in the years since. Here’s a look at the top-five moments from the Hard Rock. With the largest field in WPT history, Eric Afriat not only topped a record number of 1,795 entries but also an extremely tough final table in Season XII at the Seminole Hard Rock Poker Showdown. That final table included Chance Kornuth, Matt Stout, Jacob Bazeley, James Mackey, and Season XII Player of the Year Mukul Pahuja. Afriat entered the final table fourth in chips but was able to maneuver throughout the day until he was heads-up with Pahuja with more than a 2-to-1 chip advantage. It would take only seven hands for Afriat to claim the title. It was Pahuja’s second runner-up finish of the season and he took home $691,965. Afriat claimed his first WPT title and took home $1,081,184. He added a second title in Season XVI at the Borgata Winter Poker Open for $651,928. Here’s a look at a the heads-up hand that brought Afriat the title. Ryan Riess may be best known for winning the 2013 World Series of Poker Main Event for $8.36 million, but in April 2017 he also secured a WPT title when he took down the $10,000 buy-in WPT Seminole Hard Rock Poker Finale. The win brought him $716,088 and another highlight in an illustrious poker career that now includes more than $13 million in live tournament winnings. A native of East Lansing, MI, Riess is no stranger to success at Seminole. In 2015, he won a $2,200 Six Max event for $63,891. In August, he won a $10,000 event for $236,838. He also just won a €10,500 turbo event at the WSOP Europe for €178,582. The six-figure scores just continue to come for this rounder. Here’s a look at Riess’s title run at the Hard Rock. In April 2016, the Seminole Hard Rock hosted the first-ever Tournament of Champions to close out Season XIV. With a $15,000 buy-in for those with their names on the Champions Cup, the tournament awarded a nice $381,600. Along with that, the winner also took home a 2016 Corvette and a Hublot King Power Unico Titanium watch. In the end, Farid Yachou came out ahead in an extremely competitive field. The final tables alone included Darren Elias, Noah Schwartz, Jonathan Jaffe, Michael Mizrachi, and Vlad Darie. Yachou had previously won the WPT Amsterdam and now had his second title. He entered the final table fifth in chips, and battled back among a table of experienced pros for the win. While he has very limited tournament cashes, Yachou seems to come through when it counts. Chino Rheem has been one of the most successful players on the WPT and in April 2016 at the $10,000 Seminole Hard Rock Poker Finale, he notched his third title for $705,885. Rheem now has over $4 million in winnings on the tour and closing in on $9 million in lifetime earnings. Rheem started the final table at Seminole Hard Rock in second and held 8,560,000 chips when he got heads-up with Aditya Prasetyo, who trailed with 5,115,000. Rheem used his aggression and experience to eventually increase his lead to a 14-to-1 chip advantage before finishing off his opponent. Relive the final table and Chino’s win at Seminole below. The Season XI WPT Lucky Hearts Poker Open proved to be a great tournament for Matt Giannetti, who secured his name for a second time on the Champions Cup. Giannetti now has $4.7 million in live tournament winnings. It was a great few years beginning in 2011, when he finished fourth in the WSOP Main Event for just over $3 million. He followed that up by winning the WPT Malta in 2011 for $276,457. 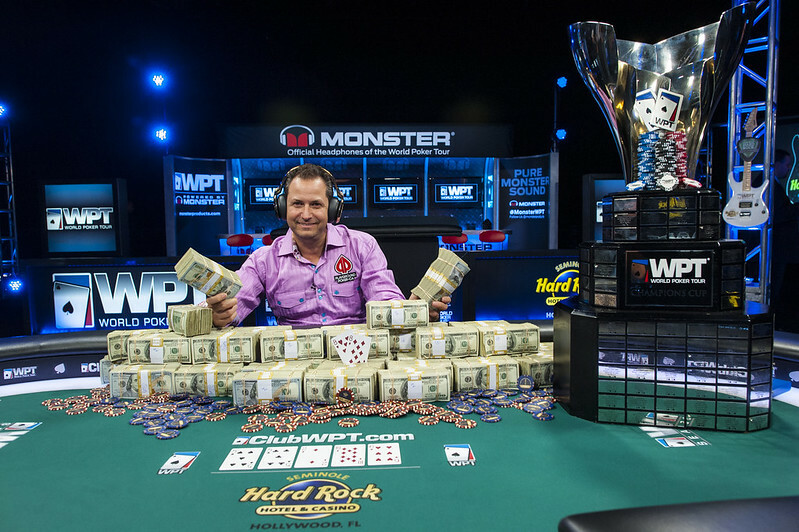 The win at the Hard Rock added another WPT title for an additional $298,304. At Lucky Hearts, Giannetti entered the final table with a nice chip lead against some tough competition including Matt Salsberg, who was appearing in back-to-back WPT final tables.